Finally after years of waiting! I impulse bought some AirPods two weeks ago. You are welcome (to all those waiting for an update)! It's OK if Aipods 2 comes with health related bells and whistles but basic job of every new version of Airpod is improved sound quality and longer battery life. So, if two new versions of airpods than all good. One simple like current with improvements and other with health sensors. Crossing my fingers for Space Gray pleeeeease. Or a variation of skin tones color so it looks more blend in. My skin is Space Gray. I love my AirPods...I use them all the time with my iPhone. On my MacBook I have a little app (ToothFairy-just excellent!) in my menu bar that I click and they connect/disconnect very neatly, every time. I do sometimes have a problem with my SE...I wish there was a button to connect. I mostly have to go into the Bluetooth settings. On the Apple TV I have to go into the Settings app also. Too many steps. I use them to listen to the TV when my GF goes to bed so I don't disturb her! LOVE my AirPods. Echoing others, they are my favorite Apple product/accessory EVER. Since the day I bought them a year and a half ago, I promised that if anything ever happened to them, I wouldn't hesitate to drop another $160 on a pair and that still holds true to this day. They've survived several drops on concrete floors, sweat, rain, the case is stained from blue jean dye, and the ear sensors no longer work (they think they're in my ears anytime they're out of the case), but the batteries still last longer than advertised and they sound like new. I'll definitely grab a fresh pair of version 2 of the AirPods as long as they retain the core values of the originals. Can you send the old pair of AirPods to me? The thing I find a little funny is that Apple teased this functionality themselves last September and I’ve been waiting to see if anyone else noticed and still I haven’t read a single story or comment. 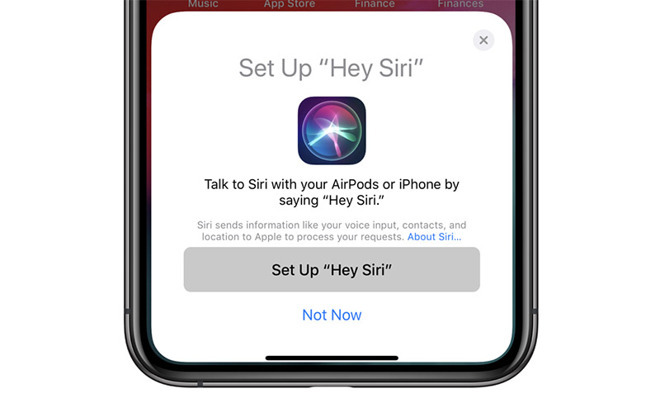 Go back and watch the intro film for the September keynote, and as the woman gets to the pond she summons Siri with the phrase and asks for quickest route. The only thing in proximity is the AirPods. I was almost certain then that it was coming soon. if anyone now writes this up I want credit lol. Mine survived a full cycle in the washing machine and work as good as new months later. Personally I'm not holding out for increased battery life. Lithium-ion batteries haven't changed much, so the smaller the device the less room there is for increased battery size. Skin-tones colored plastic? Ew. Not happening. Yeah I have an original pair from Day 1, and after daily use the charge cycles have taken their toll, the left pod runs out of juice fairly quick. It's $49 to have a single battery replaced, but I'm going to so I can give them to family at some point. Nah you just missed it, it was discussed. I wonder if debris can cover the sensors? My brother ruined a left AirPod in a laundry cycle. The right AirPod and case survived, but he threw everything away, and bought a new set. Not long after, he ruined a right AirPod in another laundry cycle. Too bad he threw the original set away! Ear detection is accomplished with two infrared transceivers on each AirPod. I can hold the AirPods in front of the foward-facing camera on my iPhone and can see the IR light. The AirPods are clean and the circular windows for these sensors are flat and flush. I can only assume some type of electronic failure. I've tried all the usual resets to no avail. No big deal since I don't use this feature, but it is worth noting that the feature did stop functioning at some point causing me to have to disable "automatic ear detection" in my devices.